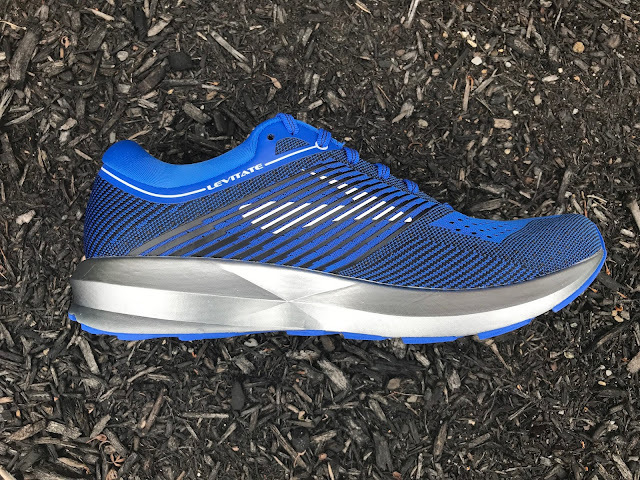 The Brooks Running Levitate ($150) is an all new, premium neutral trainer featuring an innovative DNA Amp midsole which works in harmony, and we don't use that word lightly, with a flexible arrow shaped outsole. This is a energetic, if heavier shoe, for long miles in great comfort. Levitate has a 8mm drop. Available September 30th. The weight spec is 11.2 oz/318 grams in men's size 9. Our sample size 8.5 weighed 11.1 oz. 11. 2 oz you say... Isn't that heavy for even a premium daily trainer these days? Let's put the weight aside for the moment as in our first run the energetic smooth ride had us feeling we were in a lighter shoe and certainly lighter feeling and more lively running than many shoes in its class such as the ASICS Gel Nimbus 19 (RTR review), adidas Energy Boost 4 (RTR review), or even Brooks own Glycerin 15 (RTR review), all weighing somewhat less. The Levitate fit me true to size, with one caveat. The very front tip of the shoe is a bit short and low, the darker toe blue bumper more long over the toes, rigid and lower than I like. I did try them barefoot and there the toe head room and length is perfect making me think it is the height of the toe box and the extended bumper . While new shoes often need some seasoning of the sock liner and knit uppers do tend to stretch on the run I do think they run a bit low upfront. The starring feature of the Levitate is clearly the DNA AMP midsole. From BASF, the same company that cooked up the TPU heated pellet materials used in adidas Boost, the Levitate uses a completely different foam material, PU or Polyurethane. 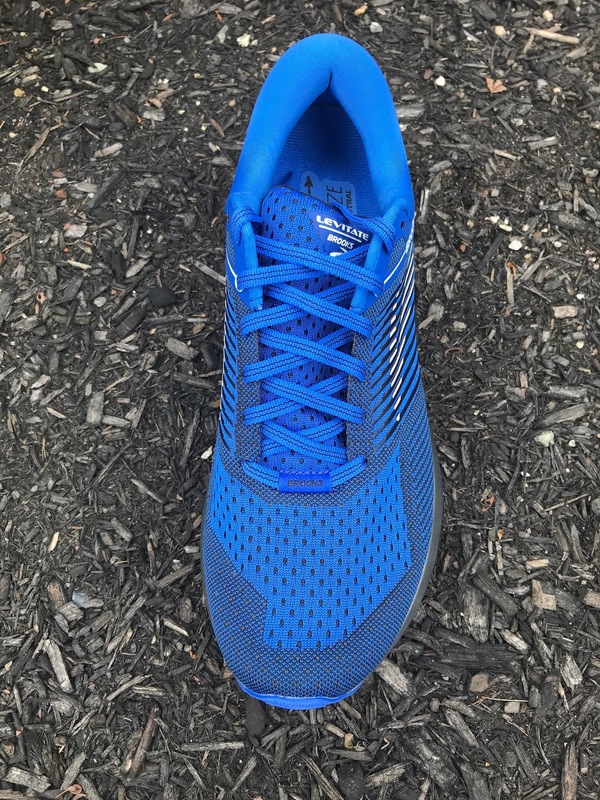 I have not seen PU in any recent shoes although Salomon will be using it as a forefoot insert in its 2018 S/Lab Sense Ultra 2 (preview here) which is called out to improve durability and consistency of cushioning over time. Brooks claims that PU provides "unparalleled energy return". To deliver "amplified experience" the PU midsole is encased in a TPU skin. TPU it is used in many ways in the midsole and even uppers and in harder plates in midsoles such as in most Boost shoes, to here as a skin. The skin is supposed to resist horizontal expansion of the midsole as forces are applied to deliver the fullest energy return or more accurately really lowest energy loss possible from the rest of the midsole. The midsole is beveled at the forefoot with a wider platform on the ground than under foot. At the heel it bevels from the middle in both directions, both narrower under foot and at the outsole but in a less pronounced fashion than forefoot as near the outsole just it front of the rear it also bevels back out a bit. Given the shiny sliver sidewall color difficult to photograph. Not exactly sure what this geometry does but suspect it assists landing and then at toe off allows the foot to roll slightly. How does this innovative midsole compare to other newer midsoles? Do Brooks' claims hold up? The term"unparalleled energy return" refers to testing vs. other unnamed materials cited by Brooks. What I can say is that the feel is one of consistent , distinctly controlled, stable, shock free cushion and then well dosed rebound from heel to toe off, at any pace. I think the TPU skin plays a huge role as does the excellent full outsole. The fact the midsole is of a single density contributes to the incredibly consistent smooth cushion feel and energy return. The cushion is in not as soft as in Brooks Glycerin 15 that I found borderline mushy, especially at heel and not much as much fun to run particularly as slow paces. It is far more consistent in cushion and transition than the Energy Boost or softer yet Supernova with their awkward off balance weight towards the heel. Levitate's forefoot is also better cushioned and more stable. It is slightly softer than the Nike Zoom Vomero whose less flexible Air Zoom forefoot I didn't like at slower paces. it has a firmer far more stable but far more shock free cushion especially at the heel than the Hoka Clifton 4. The closest comparison in feel might be the upcoming Saucony Triumph ISO 4 (first impressions review here), a shoe with a similar full single material midsole and full stable outsole. While I titled the ISO 4 article "Smooth All Over", Levitate is smoother yet. The Triumph ISO 4 is similarly consistent in feel but one can sense the Everun TPU midsole expanding horizontally, losing forward and vertical rebound more than the Levitate's. Finally while in a completely different weight class and for a difference purpose, the Pebax foam based Nike Vapor Fly (RTR review) has a similar smooth cushion, silkier yet in feel in a much, much lighter and by all indications also less durable package.. Their built in carbon fiber plate makes determining how much this midsole deflect horizontally difficult to determine. My sense is a touch more. One could also for sure think of the Levitate as a luxury updated Ghost 10 (RTR review). The fit in terms of width and hold is very similar although the materials of the Levitate are softer, especially noticeable wearing one on each foot barefoot. The heel collar of the Levitate is noticeably more comfortable barefoot. The mid foot hold of the Levitate is a touch more secure, despite having fewer overlays and especially down towards the foot bed although this may change with more miles on the sock liner. I have only jogged a few hundred yards one on each foot but the Levitate absorbs shock and "returns energy" far more smoothly and effectively than the Ghost with a smoother transition, credit to the DNA AMP midsole and simplified outsole design of the Levitate. The Ghost is more agile maybe a touch more responsive off the heel due to its very thick rubber and is more flexible up front. While early, I prefer the over all smooth ride of the Levitate for the purpose of daily training, despite its extra ounce or so weight and higher price. The outsole plays a huge role in the overall package. It has a long flex running further back and is a bit stiffer than the Glycerin 15. The outsole appears to be of two grades of firmness with the area forward of the first groove after the arrow (see below) slightly softer. The heel rubber is somewhat softer than the Glycerin 15's and the forefoot rubber somewhat firmer as best as I can tell. The heel area to mid foot outsole/midsole combination is more filled in with Levitate contributing to the stability The outsole compliments and matches the characteristics of the midsole brilliantly. There is no sense that the outsole and midsole are mis matched in firmness and there is no overly firm or soft landing and no interruption in transitions. All of this contributes to the smooth, consistent ride. The circular knit Fit Knit upper is sharp looking, beautifully crafted, secure and comfortable except for the quite low and firm front and sides of the toe bumper. There is plenty of stretchy width and no overlays at the metatarsals so wider feet should be happy. The knit is very soft, dense and lined with an internal fabric, not sure why this fabric is even included. I found the upper quite warm on a 70 degree moderately humid day, Thin diagonal overlays at mid foot provide plenty of mid foot hold and support. The tongue is lightly padded, lace up was once and done a characteristic of most Brooks shoes and something I appreciate. The Levitate has a unique and fabulous ride. The energy return, or more accurately lack of energy loss, is noticeable yet controlled and occurs without losing stability, bouncing around laterally or vertically, especially at the heel, or getting in the way of forward momentum which is sometimes the case in TPU based shoes. I wouldn't exactly use the word "levitate" to describe the ride, a word I might associate with the incredibly light Nike Vapor Fly, but they for sure ambulate in a very unique and dynamic way. The cushion is outstanding, very different in that usually softness of foam and the amount or stack of it provides cushion but here the cushion is more elastic and smooth with no sensation of softness leading to energy and efficiency loss as I found in the Glycerin. 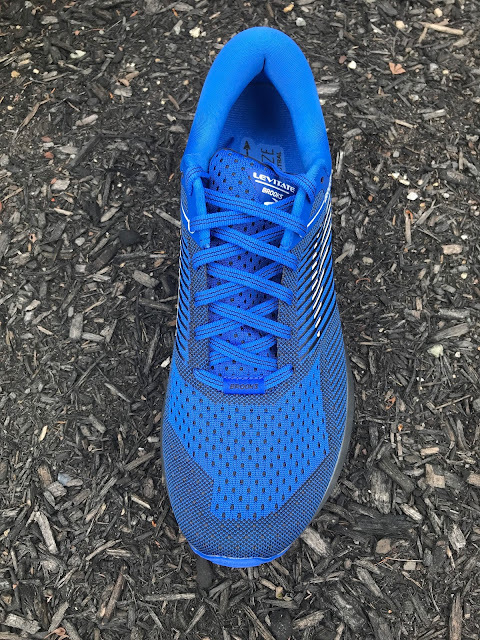 Transitions are smooth and easy at all paces with no sense of disconnect or hesitation between landing and toe off although as a well cushioned, fairly stiff, long flexing shoe they aren't snappy quick but are very decently agile for their cushion, with some welcome if muted road feel in the forefoot. At slower paces I wondered if the shoe had to much drop, forgetting it was 8mm. I run in shoes from zero to 10mm drop and here I felt there was a touch more heel lift than I prefer at slower paces. This is a tribute to the combination of PU midsole with TPU skin and outsole stabilizing landings just right. At faster tempos say around 9 minute pace that sensation went away. Drop is just a number really as the materials and how they are engineered into a design provide the effective drop and here to lose weight I believe Brooks could reduce the drop further. Readers might wonder how I can reach any conclusions after one 5 mile run. With many shoes this is not possible but with the Levitate the picture is clear. Brooks has set a new bar for controlled, smooth energy returning cushion with its new DNA AMP midsole technology. This is a energetic, if heavier shoe, for long miles in great comfort. It is outstanding. One should not expect the Levitate to levitate... or to be a performance trainer, or something it isn't. 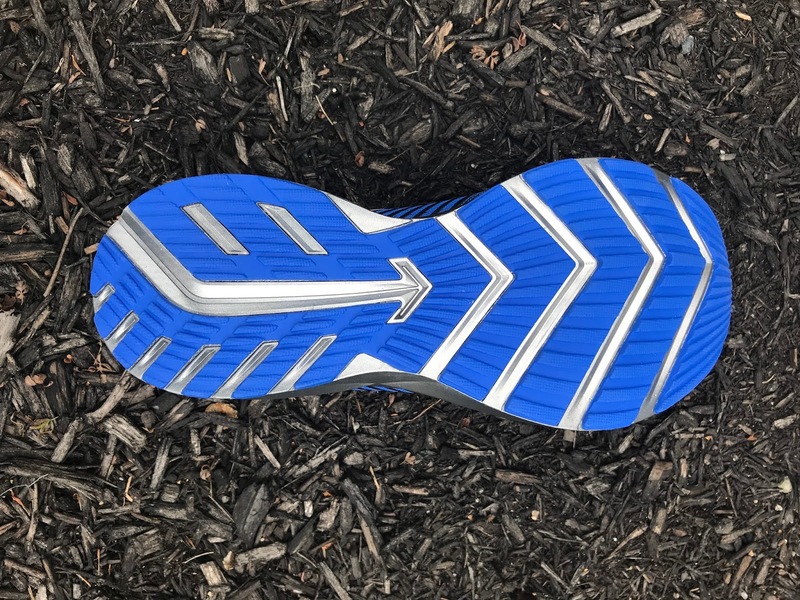 There is no question by weight that the the new PU midsole foam with TPU skin, plus the full coverage outsole must weigh more than EVA foam alternatives, and the shoe does indeed weigh more than the competition. The midsole's advantages in consistent yet stable directed energy return, smooth well cushioned but not dead or harsh on the run feel clearly outweigh for me... any perceived weight penalty for its intended purpose of comfortable long miles daily training at moderate paces. Levitate is a heavy duty, premium daily trainer and one that competes very well, and more miles will tell, but is likely for me is in a hunt for best in category in terms of ride quality, It is in a race with the slightly lighter TPU based Triumph ISO 4 whose more open upper I prefer. It is clearly superior in all respects for me, expect the upper, to Brooks' own overly soft Glycerin. The Levitate will be a great choice runners who are not gram conscious for every shoe and every run but who seek a long lasting durable and comfortable day in day out trainer with some energy to the ride. Heavier neutral runners and even mild over pronators who are hard on their shoes should consider Levitate due to its wide on the ground platform, full coverage outsole and the expected consistent durability of the PU midsole over time. I do hope, and expect, that Brooks will come out with "slimmer" DNA AMP models in the future, a performance trainer would be incredible but all in all the Levitate is a great new running new shoe with a distinctly directed and dynamic new midsole the highlight. More to come in a full review. The Levitate was provided at no cost.The opinions herein are entirely the author's. Looks like two great plush trainers Brooks leviate and Saucony triumph iso 4. Which would be the most agile, responsive shoe? Which is softer and most versatile? It looks like the brooks would be quite hot in warm climates and at slower paces you mentioned a little unstable??. Thanks. Hi Anonymous, first both are very stable with the Levitate a touch more stable for me so far. Sorry for any confusion there. I need to run more in the Levitate to determine if it is more agile or responsive than the Triumph but my sense is they are very close with the Levitate potentially a touch more responsive due to the PU foam and the Triumph ISO 4 a touch more agile due to being slightly more flexible up front although both having the same long flex. Would you recommend the Levitate or the Triumph ISO 4's if I am shooting for a more comfortable toe box. I tend to get irritation on the outside of my foot..sort of have a tailors bunion. Thank you! I would give the front upper comfort nod to the Triumph ISO 4. Its front of the toe box and toe bumper construction is definitely softer than the dense stiffened mesh of the Levitate. ISO 4 is also slightly less pointy upfront. Thanks a lot! I definitely want a toe box that is more squared off, so I will keep that in mind. Great review! I am running my first marathon and wondering which you would recommend for the race, Glycerin 15 or Levitate? I am currently training with Launch 3, and find them very comfortable, more so than the Ghost 8, but after 12-14 miles in the Launch I feel it in my knees. I am 200lbs, 6 ft, neutral runner and planning on a 10:30/m pace for the marathon. Thank you! While heavier than the Launch, Ghost, and even slightly more than Glycerin I would recommend the Levitate for a marathon at your pace. I think they are more stable and more consistently cushioned with a touch more rebound than the other choices. I do prefer the Glycerin upper to Levitate's but otherwise I find the Glycerin very soft in the heel. Best of luck on your marathon! Let us know how the shoes and race work out. Hi! Thanks for the information. I have worn Launch for the last couple of years, but I am not a runner, more of a quick walker. How do you think these would do as "walking" shoes? I have a torn meniscus that I don't intend to have surgery on, and hope these wouldn't be too heavy and/or spongy like some others. Brooks tend to give me good support in my knees. Thanks for writing. The Levitate is not spongy but is a bit firmer than the Launch while being more bouncy responsive than Launch or slightly heavier than Launch Ghost. It is a heavier shoe than either of these two but I would not focus on its absolute weight. I find it very stable and certainly more stable than say the Brooks Glycerin. I think they would be very comfortable walking shoes. Do they have the similar softness to the saucony triumph iso 4. which is softer/firmer ? Thanks. Thanks Anonymous! Much appreciated! Glad you enjoy them and I too and wishing and I think it is coming for a lighter AMP DNA midsole Brooks performance trainer. Sam, as always great review and great insight. I wanted to leave a comment regarding the post which stated that the Glide 8 is heavier than the Levitate. I actually am running in both of these shoes right now and the Levitate is significantly heavier. I weighed both on my kitchen scale and my size 9.5 Glide 8 came in at 10.25 oz, while the Levitate came in at a whopping 11.625 oz. I love the nature of the responsiveness, feel, and vibration damping of the cushioning. The transitions on the Levitate are great as well, but there's no escaping the fact that these things are heavy. I always notice the weight of these shoes, especially on runs greater than 8K. Between the glycerin & the levitate, which would you recommend for a teacher who stands on his feet all day and walks around the classroom? Just wondering when the full review for the Saucony Triumph iso 4 will be published. Any further thoughts comparing it with the Brooks Levitate. 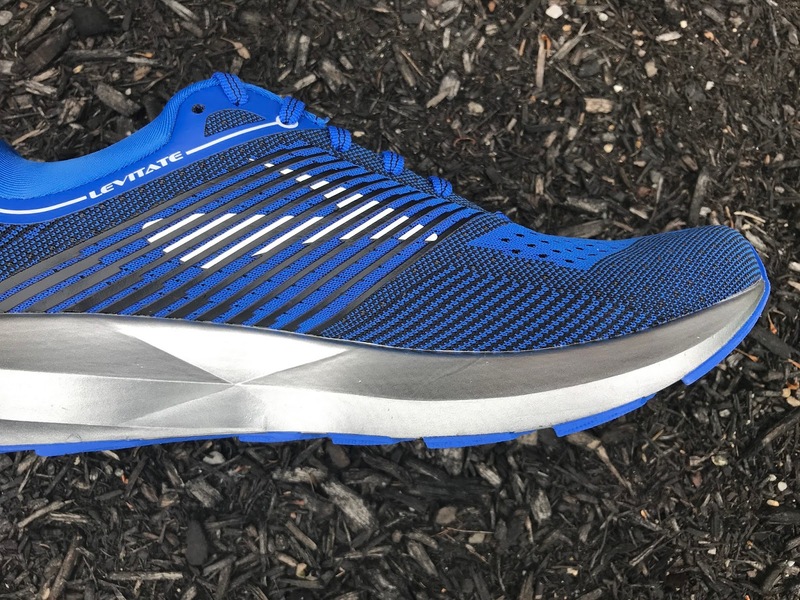 I heard the Levitate is quite a firm shoe, is the triumph iso 4 a softer shoe to run in. Ran in the Triumph ISO 4 yesterday and was surprised by how firm it felt. To me it felt much firmer than the ISO 3 which I’ve put many miles on. In your opinion is the Levitate firmer or softer than the Triumph 4? I definitely don’t want to run in anything firmer than the ISO 4 as most of my miles now are slow and easy. Thanks. Thanks for your reply. May give the Levitate a try. Seems like the Levitate could do recovery runs just fine but could also be used to go fast. I've been using the Zealots ISO 3 for slower recovery runs but the upper can be a bit sloppy although it's a great shoe too. The Levitate feels more secure. Thanks so much for pointing out Levitate was missing from our index. It has been added. I believe my longest run in the Levitate was about 10 miles. It is an excellent long run shoe as the cushioning is great and the energy return smooth and consistent. The only caveat is the weight. So for long runs at moderate paces fantastic but I would not run a marathon for example in them unless the only goal was to finish it and at slower paces. I run about 3:40 these days (age 61) and my race shoe of choice is the Nike Vapor Fly, You will see a review for it below. In Brooks for a slower pace marathon I might reach for Ghost.